​We have all of the latest Pilates equipment. We also have a staff with the knowledge and experience to know how to use it. Although our teachers each have a unique style, collectively our focus is to help you find flexibility and strength in every movement. ​This practice uses 6”- 9” balls to release tightness and tension. You lie on the balls and gently roll your body across a yoga mat, allowing your muscles to lengthen and relax. ​This cardiovascular workout is an intriguing blend of dance, martial arts and healing arts. 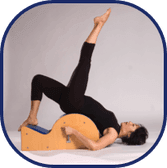 Suitable for all ages and abilities, NIA dramatically improves your strength, balance and flexibility.